Front: Kade Richardson, Weston Campbell, Noah Shirk, Jackson McNeal. 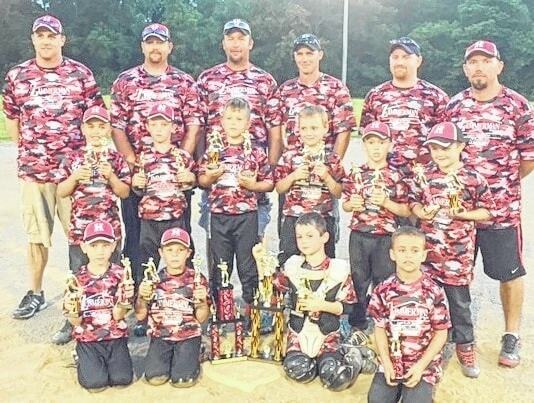 Second row: Cy Cummins, Talon Archer, Bryce Burton, Adrian Crumbly, Kolten Cummins, Colton Corcoran. Back row: Coaches Shawn Corcoran, Brad Cummins, Bryan Burton, Matt Archer, Nick Richardson. Huntsville 1, Zimmerman Realty Agent Kyle Springs, completed a great season June 22. Logan County pre-season champions, an undefeated regular season, and now post season champions. During the post season tournament, they defeated West Liberty 2, Rushyslvania and Ridgemont. They suffered their only loss to Belle Center 1, sending them into the losers bracket earlier in the tournament. Meeting back up with Belle Center 1 Monday night lead to some great baseball. in game 1 of the championship match the score was tied at the top of the 6th inning but Huntsville came out swinging and won 17-10, forcing them into a second close game but once again Huntsville came out on top with a score of 16-12.